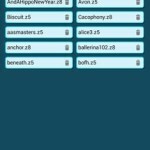 Bored of runner games? Tired of farming coins? Ready for entertainment that focus on depth and story instead of mindless and repetitive button mashing? 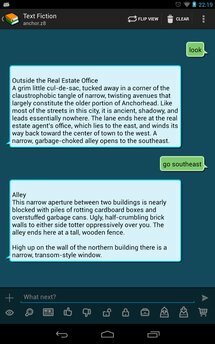 Then welcome to the world of Interactive Fiction (aka Text Adventures)! 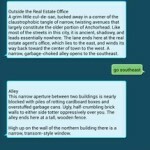 Here every game is a story waiting to unfold as you guide your alter ego by texting where to go and what to do next. 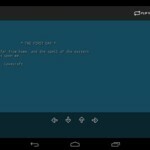 Text Fiction is a Z-Machine story interpreter (aka terp) with a modern, SMS style user interface for playing Z-Code games like the famous Zork triology. Hundreds of free stories, ranging from fantasy over horror to science fiction are available for download. * Plays z3, z5 and z8 games. * Configurable quick command keys to cut down on typing (long press to modify). * Clear words from the prompt by double tapping a chatbubble. 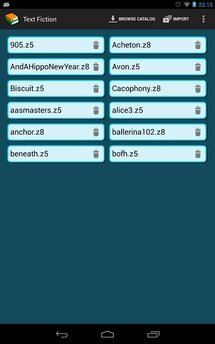 This app is free and open source software. For more information, sideloading options or to leave a tip, please visit my website.